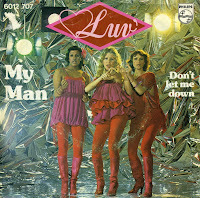 Luv's debut single 'My man' was released in 1977. It was a far cry from the unpretentious, happy, bubbly pop songs that would become their trademark sound. Instead, this track was a tearjerker of sorts, about a woman whose man, a railroad worker, has been murdered when he tries to stop a fight between two men. The song shocked the Netherlands, because it was released at a time when a train was hijacked. The single reached number 12 in the Dutch Top 40 and number 10 in Belgium. It was the official start of a career that would take off for real with 'U.O. me' the next year.